CABLE HIGHLIGHTS: With no playoff games last night, it was a slow evening on cable. Bravo’s REAL HOUSEWIVES OF NYC topped the night, down 0.03 to 0.42, with lead-out THEN & NOW down a tick to 0.16. Adult Swim’s midnight NEON JOE continued its limited run, down 0.05 from Tuesday to 0.38. 5 of the night’s Top 10 shows were news hours, led as is increasingly usual by MSNBC’s RACHEL MADDOW SHOW at 0.36/2.7M, with the 10PM CNN TONIGHT at 0.34/1.4M, and Fox News’s THE FIVE at 0.30/2.6M. Lifetime’s LITTLE WOMEN: ATLANTA REUNION SPECIAL was at 0.36. On HGTV, PROPERTY BROTHERS gained 0.06 to 0.35, and HOUSE HUNTERS climbed 0.04 to 0.34. TLC’s MY 600 LB LIFE ticked down to 0.30, and BIG & LITTLE was at 0.23. 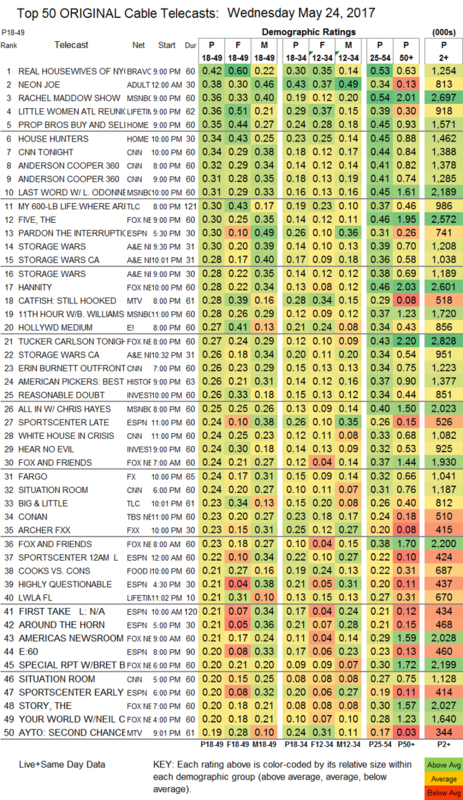 On A&E, STORAGE WARS was at 0.30/0.28/0.26, compared to last week’s 0.25/0.23. On MTV, a CATFISH: STILL HOOKED special was at 0.28, down 0.06 from last week’s regular episode, and ARE YOU THE ONE was up 0.03 to 0.19, with a related lead-out special at 0.12. E!’s HOLLYWOOD MEDIUM fell 0.04 to 0.27. On ID, REASONABLE DOUBT lost 0.02 to 0.26, and HEAR NO EVIL was up 0.02 to 0.24. FX’s FARGO shed 0.02 to 0.24. The season finale of FXX’s ARCHER rose 0.06 to 0.23. On Food Network, COOKS VS CONS edged up 0.02 to 0.21, and BAKERS VS FAKERS returned at 0.15. On TV Land, NOBODIES climbed 0.04 to 0.09, and LOPEZ was up 0.02 to 0.08. POP’s comedies stayed off-chart, HOLLYWOOD DARLINGS up a tick to 0.03/109K, and RETURN OF THE MAC also up 0.01 to 0.02, but with a terrible 37K total viewers. Sundance’s GOMORRAH was at least better than that, up 0.01 to 0.02/60K.